Do Fire Ants Tend Aphids? I got a question from another entomologist this week: Do fire ants tend aphids? At first this seemed straightforward enough. Sure they do. It’s mentioned in the literature (see below). Although I couldn’t recall ever seeing our local Solenopsis xyloni tending aphids, we don’t get all that many aphids here. Delving a bit deeper, I decided to see if I could find an image of fire ants tending aphids. Our local Arizona Cooperative Extension did me proud, in their article A Fire Ant Smorgasboard. Except, of course, I’m pretty sure those aren’t fire ants. 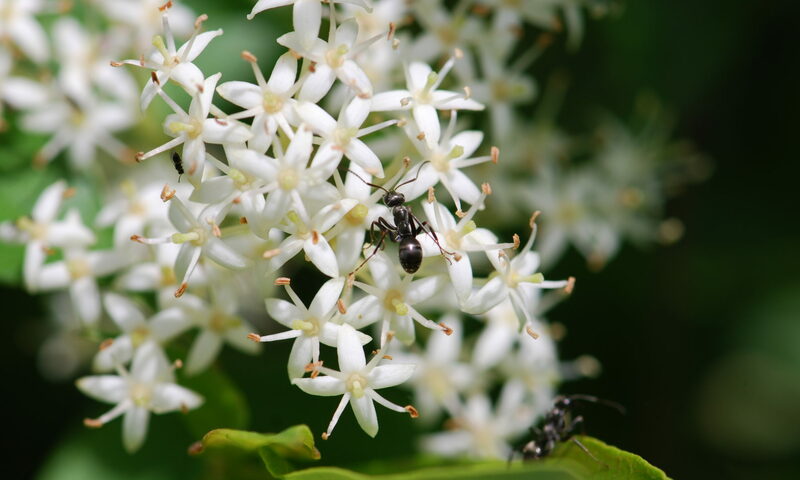 Aren’t they acrobat ants (Crematogaster)? Well, at least they aren’t the only ones to mistake another ant for fire ants. Over at 6Legs2Many she has a whole post full of “Things that are not fire ants.” Too fun. On a more serious note, I suspect because fire ants have underground foraging tunnels, they may “tend” to specialize on root-feeding homoptera. Thomas Rossiter Barnum (2008) Recruitment to and defense of aphids by fire ants and native ants and an estimate of their trophis positions using stable isotopes. M.S. Thesis, Auburn University. It’s fun to see this as a post. I’m one of the undergraduates working with Ken Ross at UGA and I’m actually going to be studying the fire ant Solenopsis geminata for most of the rest of 2011. Tentatively, I’m looking at the fire ants in industrialized coffee plantations in Costa Rica. As you may have guessed from invicta, S. geminata are much happier in sunny, disturbed monoculture than in the shady polyculture of “organic” coffee farming. One of the things I’m studying will be interactions between S. geminata and aphids in the industrialized coffee. Does their friendliness to aphids (or predatory habits) impact coffee production? Again, tentatively, I would say it’s relatively established that these fire ants do tend aphids. The 2005 you mentioned paper is one that I was going to reference, but also “More Aggressive Ant Species Provide Better Protection for Soft Scales and Mealybugs”, Buckley and Gullan, Biotropica 1991. I haven’t read it yet, but Kaplan and Eubanks 2002 (referenced in the 2005 Ecology article) seems to cover the subject. The 1991 article regards S. geminata; the 2002 covers invicta. If my undergraduate-ness weren’t standing in the way, I could actually scrutinize these papers and give you a thoughtful response, but in the interest of time I’ll leave it at this. OH – Mark Fisher wanted me to tell you that this Athens crew is still on board for reading Tschinkel, but we’re off to a slow start. We’ll keep you posted. I’ve seen S. invicta visiting aphids in Florida, but surprisingly few times. I suspect they do a lot of honeydew scavenging, i.e. from the ground and leaf litter, and you may be right, WAA, about the subterranean tendency. Fire ants do seem quite fond of extrafloral nectaries, though. I’m sorry to hear that you find Tschinkel tedious! Somehow it really resonated with me, I happily read it cover to cover last year. I thought it might help with the retention if I read it again. Mostly, I’m just happy that such a volume exists; it was a rocket-boost to my knowledge of fire ants and ant biology in general. Of curiosity, have you read Wilson and Holdobber? If so, would you say *The Ants* is more or less tedious than *The Fire Ants*? Thanks for your insights about fire ants scavenging honeydew. S. xyloni workers definitely tend extrafloral nectaries here. Cotton has extrafloral nectaries, doesn’t it? I didn’t and wouldn’t use the word “tedious”. I just said that for me, for several reasons, it is not an easy read. An even my esteemed colleagues of the Athens crew are, as you say, off to a slow start. I have read “The Ants” cover to cover a couple of times, though not recently. I am an ant nerd, I suppose. But, I will say, as reading goes, I found their somewhat popularized version “Journey to the ants” more tractable, and maybe better deserving of a prize along the lines of the Pulitzer (if either is). Haha, point taken about us being behind. Hopefully we’ll get going in the next few weeks. Roberta, I think you’re totally right about the Pulitzer. It probably a had much more to do with Wilson’s fame (and the admirable undertaking) than the content itself. I don’t actually know who I’m talking to – are you a researcher, James? I’m an undergraduate working with Ken Ross in Athens, relatively on sticking with ants in my graduate years. Wonderful to be able to talk to people who have so much more experience in this field than I do. Ah Buck, callow youth! but glad to read you’ll be sticking with ants. You’re in good hands there in Ken’s lab. Trager, J. C. 1991. A revision of the fire ants, Solenopsis geminata group (Hymenoptera: Formicidae, Myrmicinae). Journal of the New York Entomological Society 99: 141-198. See http://osuc.biosci.ohio-state.edu/hymenoptera/manage_lit.list_pubs?author=Trager&Submit=Submit+Query to download, if you wish. Hi, thanks for the mention. Been having fun exploring your blog. I had to comment here, because this topic is actually something of a specialty with my research advisor, Dr. Micky Eubanks. His lab has done a lot of work on fire ant-aphid mutualisms, especially in cotton fields. One interesting result of this research is that fire ants-aphid interactions can actually be beneficial to cotton. 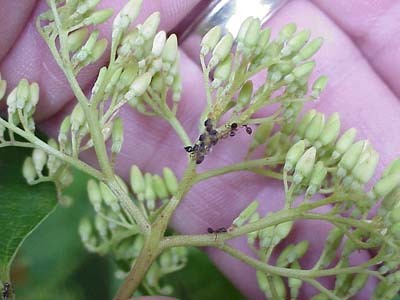 The aphids attract the fire ants to the cotton, and although the fire ants promote aphid colony growth they ants also kill more damaging cotton pests like caterpillars. Interestingly, fire ants may have more arboreal foraging opportunities (and thus climb more) here in the U.S. than in Argentina, where they are native. This seems to be due to release from competition with more dominant arboreal ant species in Argentina. Our native species don’t quite know how to handle fire ants. Thanks for letting us know about Dr. Micky Eubanks’ research. I do think that the relationships between ants and aphids and plants is more complex than we have realized, and that sometimes aphids can act as living extrafloral nectaries. While in Palau in 2008, I’d also recorded them as tending scales on roadside grasses in my field notes, but didn’t collect any specimens. On an unrelated note, have you heard people call Crematogaster “cocktail ants?” Disappointingly, I guess it has more to do with the position they hold their gasters in than having classy taste in beverages. Thanks for the link to the .pdf. That S. geminata is far from its normal range. The Camponotus interested me, too, especially C. chloroticus. I haven’t heard of Crematogaster called “cocktail ants,” but a quick search shows that is a common name.